Autoloc 4 Door Power Lock Kit With Alarm Autoloc 4 Door Power Lock Kit With Alarm, Autoloc AUTCA4000 Alarm System, 4 Door Power Lock Kit with Alarm, Door Lock Kit with Alarm, Alarm System, Car Alarm System, Truck Alarm System, SUV Alarm System, 4 Door Power Door Lock Kit, Power Door Lock Kit [Autoloc AUTCA4000 Alarm System] - $238.95 : 3rd Strike Performance, Your Source for Late Model MOPAR Performance Parts and Accessories! POWER UP! With AutoLöc's power door lock conversion kit. Our remote power doors transform your manual door locks to automatic door locks in under an hour! 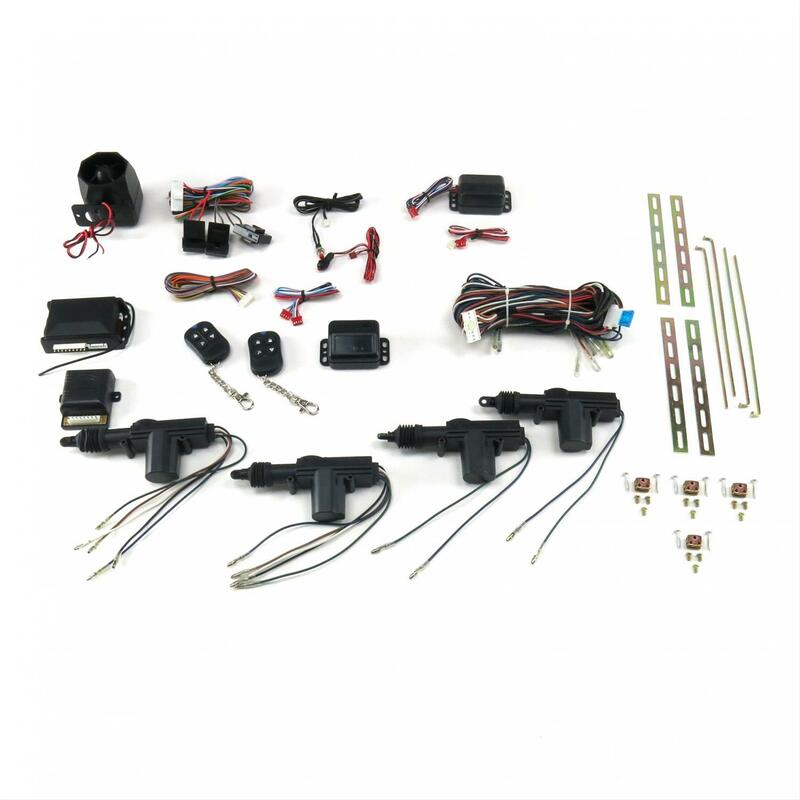 Each kit is specifically designed and manufactured with the highest quality parts. Every kit comes with AutoLöc's Limited Lifetime Warranty. AutoLöc's 4 Door Central Power Door Locking System w/Alarm is unique because it allows you to activate your locks using your original plungers, eliminating the need to mount switches in your door or fill in the hole left by your original door plungers. When the plunger in your drivers door is depressed or raised, or your key is turned, the other door in your vehicle automatically power locks or unlocks. This is easily accomplished because of AutoLöc's exclusive 5-wire actuators with built in micro-switches, which communicate with one another to act simultaneously, resulting in prompt, professional performance and easy installation. Each CA4000 comes with a Stellar ST8001 Vehicle Security system. Measuring less than 4x 2 inches, the ST8001 offers the most advanced security features ever built into a compact case. With one of the most advanced Dual-Stage Shock Sensors available, the ST8001 is a great alternative to the over-priced and hard to install alarms that are commonly available today. Using technology developed for the Tomahawk Cruise Missile, the ST8000's fully adjustable Shock Sensor features Fuzzy Logic Programming, "warn first" mode, and 5 zones of protection. The ST8001 comes loaded with features, including built-in Parking Light relays, Remote Keyless Entry, Extra Outputs for Additional Accessories, Code Learning/Rolling Technology, Remote Shock Adjustment, Priority Lock/Unlock, Horn Honk Output, Parking/Dome Light Supervision, Ignition Triggered Locks, Remote Anti-Hijack, Silent Arm/Disarm, and much more. Each ST8001 comes with two long-range remotes, plug-in super bright LED, plug-in wiring harness, and shock impact case. The ST8001 features a Limited Lifetime Warranty.